Arsenal will meet Liverpool in the quarter-finals of the Champions League after they were paired together in Friday's draw in Nyon, Switzerland. Arsene Wenger's side will play the first leg at home on 2 April, with the return leg at Anfield on 8 April. Manchester United, who beat Lyon to reach the last eight, were drawn against Real Madrid's conquerors Roma. Chelsea, the fourth English club in the draw, face Fenerbahce, with Schalke 04 versus Barcelona the other fixture. The winners of the Arsenal-Liverpool showdown - the first time those two clubs will have met in European competition - will then take on Chelsea or Fenerbahce in the semi-finals, while Manchester United or Roma face Barcelona or Schalke 04. The legs for the last-four ties will take place on 22/23 April and 29/30 April. It means if Chelsea overcome Fenerbahce in their quarter-final, not only could they face their semi-final conquerors of 2005 and 2007 in Liverpool but also that England would be guaranteed a presence in the final in Moscow on 21 May. And with Fenerbahce and Schalke 04 appearing in the Champions League quarter-finals for the first time, English sides make up four of the top five favourites, according to the bookies. 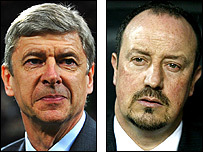 Liverpool boss Rafael Benitez is confident his side can match Arsenal over two legs, as well as in the Premier League game in between. "It was a possibility and now we will see how we can afford these three games," he said. "The first thing is to think about Arsenal and I think it's important to go one step at a time. Nobody wanted to play an English team - in this case, we could play two English teams. "But it's not the worst moment for us. We have confidence, we are playing well, we are scoring goals." Arsenal manager Arsene Wenger said: "We have the holders and the finalists on our route, having just knocked Milan out which was a big hurdle. "We were strong enough to knock the holders out so let's do it against Liverpool. "I said ideally you would like to pay a foreign team because it's Europe but I prepared myself to play anyone. We are highly determined to go through." Meanwhile, Manchester United manager Sir Alex Ferguson was surprised to be drawn against Roma again. "It's incredible," he told the club's website. "I had a strong feeling that we would draw an English side. "It's amazing to think that we will have played Roma six times in a year. That makes it an intriguing tie because we know a lot about Roma, but they know a lot about us." Chelsea manager Avram Grant talked up quarter-final opponents Fenerbahce but could not help looking beyond the last eight. "Every game in the Champions League quarter-final is not an easy game," he said. "They played very well against Sevilla. We know Arsenal lost in Seville. "It's not an easy draw but our targets stay the same. We are a club that hasn't been in the final. We want to be in the final. "This is our main target for the next years but we want to do it as soon as possible." BBC Sport football expert Alan Hansen concluded: "It would have been great for England to have all four sides kept apart but Manchester United and Chelsea have got to be happy. "They are favourites to get through their ties and, with Arsenal still fighting on two fronts and Liverpool being able to concentrate on the Champions League, I'd tip the Reds to join them in the semi-finals. "The only way to judge your domestic product is in European competition and in having four sides out of eight in the quarter-finals, England have shown their league is second to none." Who can still qualify for Europe?